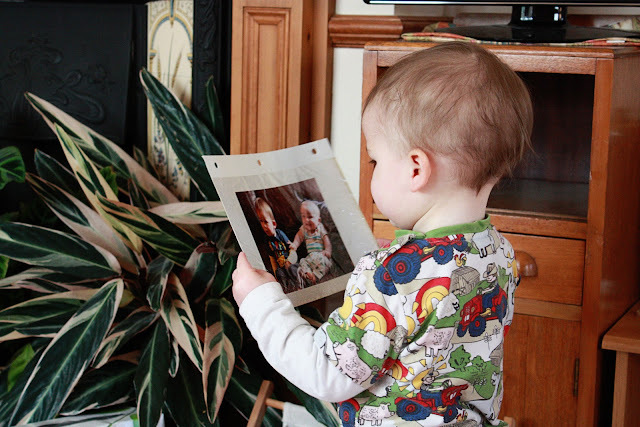 Wilf admiring a picture of himself as a six month old and his cousin the same age he is now (16 months) I wonder if he recognised himself in that funny chubbly thing? His shirt is so cute! Did you make that it is it from a shop? hee hee this is great! i can really sense his concentration :) and the back of his head is so soft and cute...there is nothing as sweet as stroking a baby's head. How sweet is that! Chloe loves looking at pictures of herself too! In deep retrospect - in the coolest top I have ever seen! !